The ERC-funded SPECTRUM: Visual Translations of Jerusalem project documents and examines visual translations of Jerusalem across Europe, including such famous examples as the Temple Church in London or the Sacri Monti of Piedmont and Lombardy, but also a multitude of lesser known sites which have hitherto been studied only at a regional level. 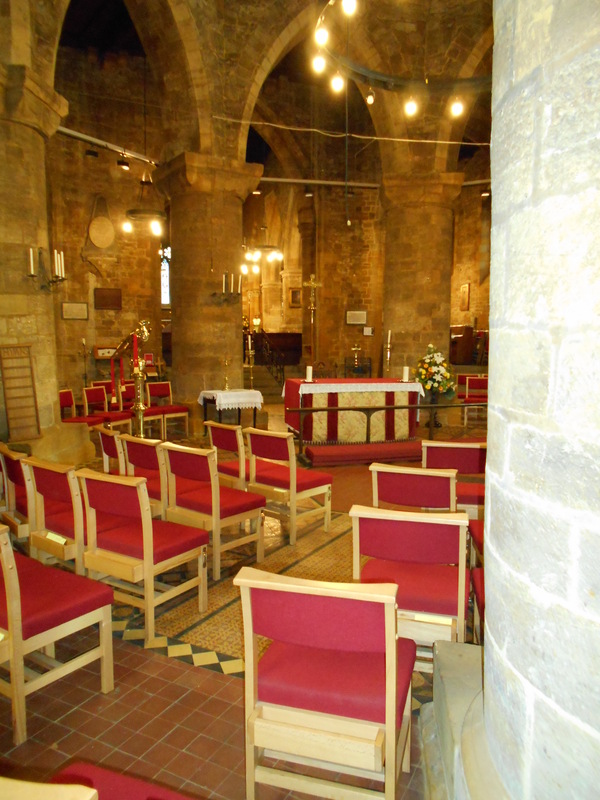 One well known English example of these monumental reproductions of Jerusalem is the Church of the Holy Sepulchre in Northampton, built in the early twelfth century by Simon de Senlis, the first Norman earl of Northampton and Huntingdon. 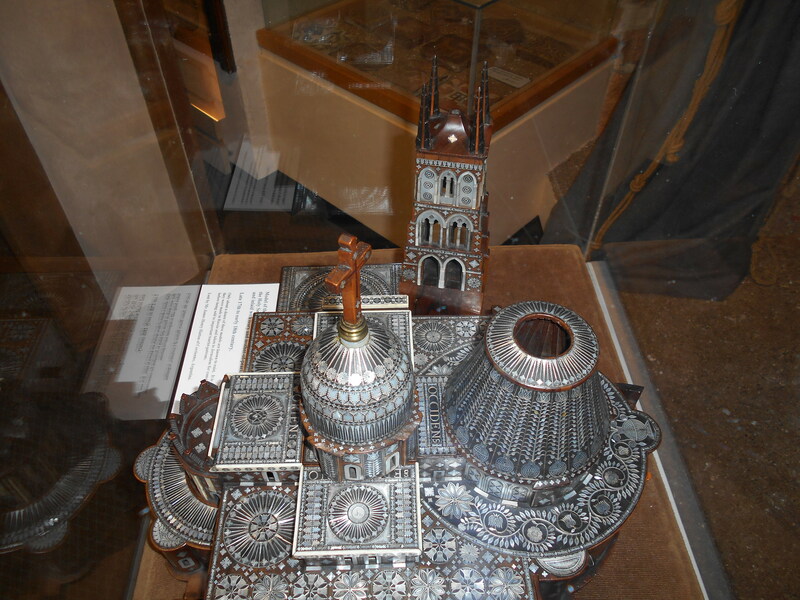 This model of the Holy Sepulchre is owned by the Hutton family and can be visited at Northampton Museum and Art Gallery. 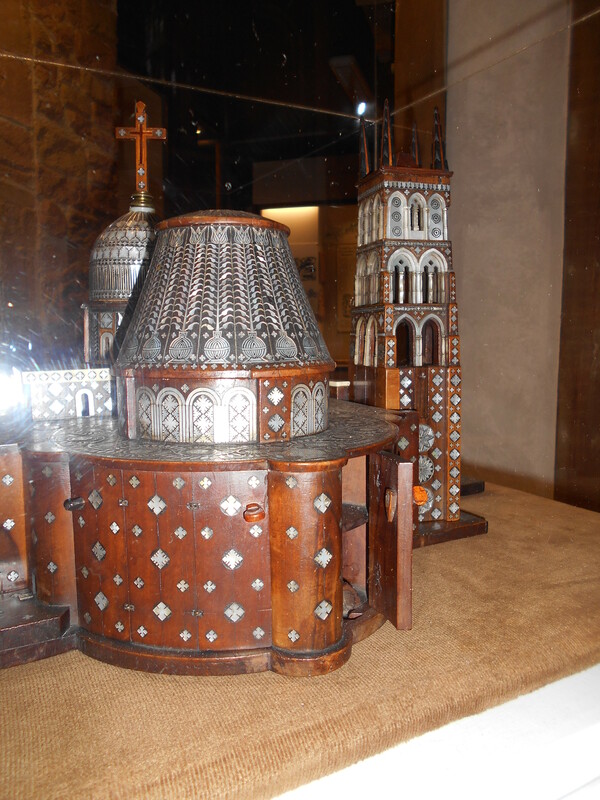 These miniature scale models record the appearance and architectural features of the Holy Sepulchre from the period of its 1555 restoration to the disastrous fire in 1808. They are now valuable sources for historians. 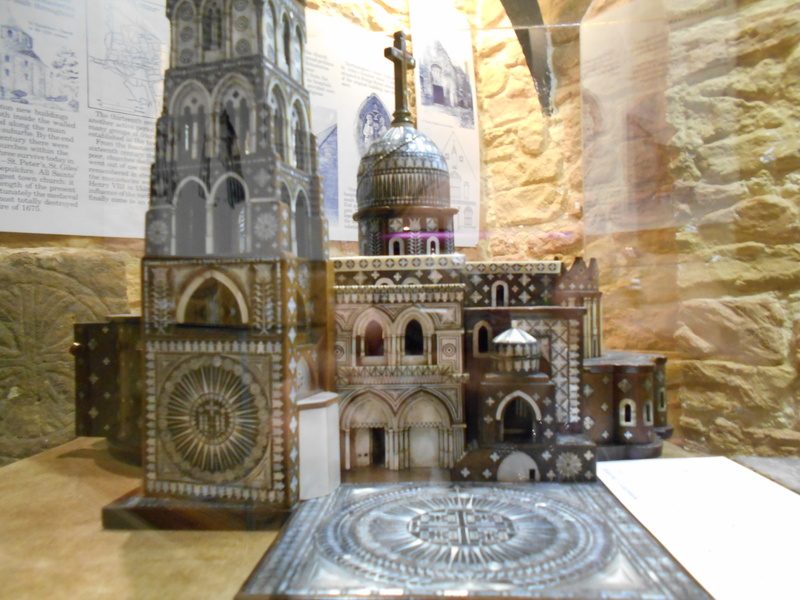 The models were constructed in relation to the detailed plans and drawings of the Holy Sepulchre drawn up at the end of the sixteenth century by a Franciscan friar, Bernardino Amico. The practical execution of these models was not the responsibility of the Franciscans, but craftsmen in Bethlehem and Jerusalem. The scale models were produced in relatively large numbers in the seventeenth and eighteenth centuries: as souvenirs for pilgrims and grand tourists, and as elaborate diplomatic gifts for rulers. Inlaid with ivory and mother of pearl, the Northampton model is made out of shittim or shittum wood – better known today as the acacia. The shittah tree, identified with either the acacia nilotica or more usually, the acacia tortilis, can be found across the Middle East, especially in Egypt and the Sinai peninsula. It is probably from here that our model’s materials were sourced. 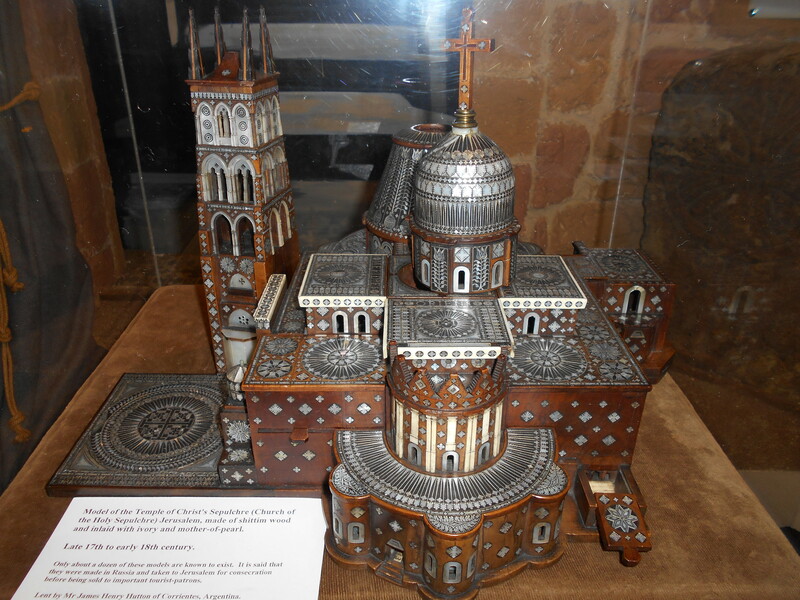 The use of shittim wood to make the Northampton Holy Sepulchre model was not simply a question of using cheap, locally available timber. Shittim is mentioned numerous times in the Bible. It is the material from which God commanded that the Ark of the Covenant and parts of the tabernacle, including altars and holy vessels, be made in Exodus 25-27. The connection back to the Old Testament, and the sense of continuity with a lost sacred object it might provide, helps us understand why these models were so treasured. The models were designed like Lego bricks – they could be detached and rebuilt part by part, and each individual ‘brick’ was signed with letters or numbers. Every model came with a parchment scroll detailing what each letter or number signified. This might be a bell tower, a gate, a chapel, an altar, the site of a particular tomb, or a place where the Virgin Mary stood during the Passion. In this way, one could inspect every feature of the church, remembering and imagining Jerusalem exactly how one pleased and in as much detail as desired. Nor were such scale models restricted only to the Holy Sepulchre Church. There are also surviving models of the Grotto of the Nativity and the entire Church of the Nativity in Bethlehem. In this view of the south transept facade of the church, still the main public entrance of the Holy Sepulchre, you can see the attention to detail in the model. Just as it still is today, the right hand side of the door has been blocked up. 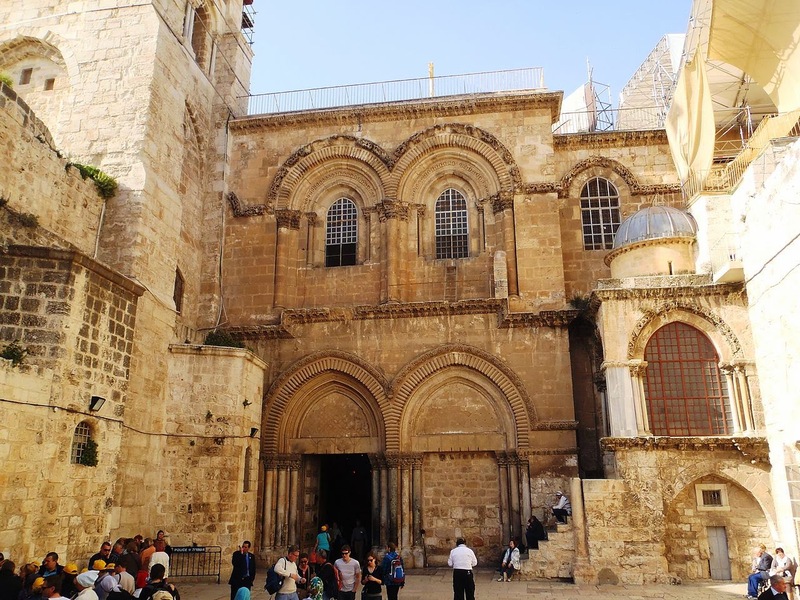 The building on the right, up the tiny staircase, is the medieval Chapel of the Franks, now the tenth station of the Via Dolorosa. And on the other side of the miniature building is the Anastasis Rotunda, where the empty tomb chamber can be found. Thanks for this fascinating blog Laura. I’ve worked quite a lot on these models and was involved in the British Museum exhibition “Sacred Souvenir” in 2012. We’ve just published an article in the British Museum Technical Bulletin about the models which includes detailed analysis of the materials and methods of production. My own interest is in Bethlehem as the centre of artisinal production for these kind of objects. I’m happy to send you the article and other work on Bethlehem I’ve published if it’s of interest. I didn’t realise they had one in Northampton!